Through stories, documentaries deliver information and inspiration that inform the choices we make about our lives and our planet. A well told story makes a difference. Because stories create an emotional bridge to viewers often not possible in any other way. And that connection inspires action. With committed donors and sponsors as partners, we are catalysts. We accelerate media campaigns that move viewers from education to inspiration to action. To make informed choices and provide actionable, measurable results. We create ‘sustainable tomorrows’ one viewer at a time. For over 35 years, our Video Project group has provided the best media programming available on critical social and global issues of our time to classrooms and institutional communities to advance awareness and thereby, encourage action. 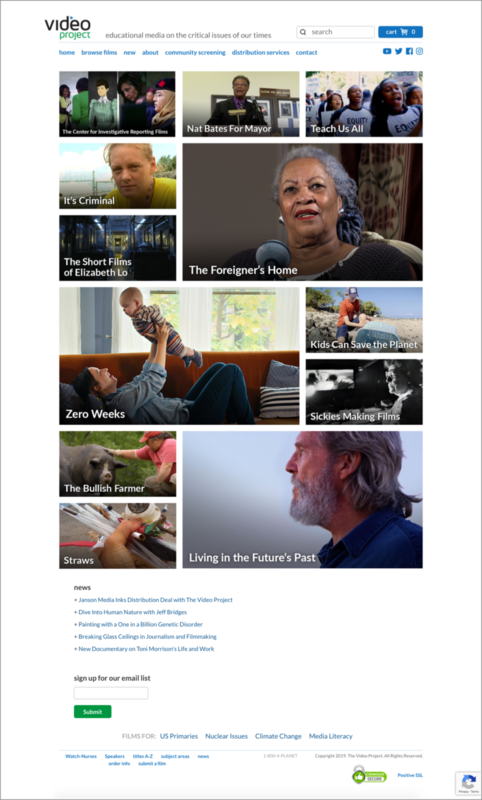 The Video Project collection features programs for all ages from over 200 independent filmmakers, including Oscar and Emmy winners, as well as films that aired on Showtime, HBO and PBS. Our films are regularly honored with top festival awards and with critical praise from major review publications. ©2019 The Fund for Sustainable Tomorrows. All rights reserved.